What are rosettes and how are they used? > Blog> Product Information>What are rosettes and how are they used? A rosette is a block of MDF or wood, they’re fitted in the top corners of your architrave installations to help eliminate complex joins. Rosettes are slightly wider than the architrave to allow smooth transitions. Not only do they make it easier to fit, they also offer a visually different approach. What situations might you consider using a rosette? From a design point of view, a rosette coupled with plinth blocks can give off a more elegant and traditional look. They have been used in room designs since the 1800’s and were especially popular in Victorian homes. Older homes generally tend to have more misaligned walls, this causes difficulty with adding the architrave as it might not sit flush. 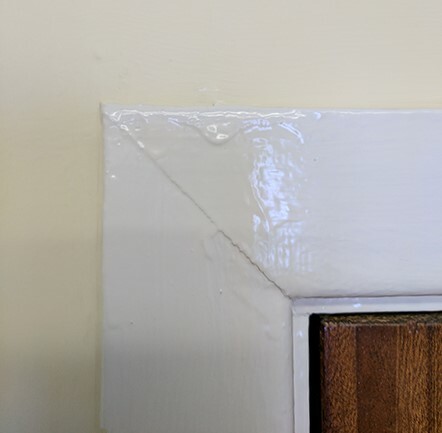 A rosette could help eliminate issues as it reduces the need for a smoother connection, this is due to the rosette being greater in depth than the architrave. 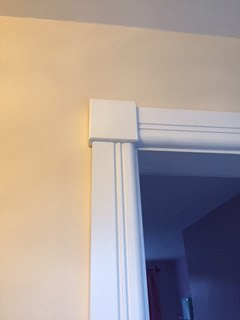 The most popular way of fitting architrave is to do a mitre joint, this is a 45-degree cut at the end of the pieces you are connecting. These cuts then form a 90-degree angle to complete a straight corner fit. The problem many people face when creating a mitre joint is that measuring and cutting a smooth 45-degree angle can be difficult. One way to make the cut would be to use an angle saw, which could be expensive if you are only planning to use it once. Another option which you could consider when making the cut is using an Impact Resistant Mitre Box with a hand saw. To reduce the complexity of the angled cut, rosettes can be used. They reduce the need for you to make a 45-degree mitre cut. You can then add the rosette on top of the vertical architrave and join the horizontal one going into it. The rosette is usually wider than architrave to give the impression of it feeding into it. Richard goes on to say: “I would have the rosette in 25mm thickness and architrave in 18mm”. This gives us the overhang so that the architrave feeds into the rosette. When ordering the rosette make sure it’s bigger than the architrave in depth and height. For the depth, it’s worth choosing the next size up compared to your architrave. If you need further help (and a full range of options), don’t hesitate to contact our sales team. You can call us on 01922 451 689 or email enquiries@skirting4u.co.uk.